We all want a massive email list, but growing one can be like climbing a mountain. It takes a lot of time, hard work, and perseverance. Or, does it? Today, I’m going to share stories of three different businesses – a freelance writer/programmer, an iconic candy company, and an innovative fragrance products company – that accelerated the growth of their email lists using giveaways. Each of the stories is unique, inspiring, and jam-packed with insights that every business considering a giveaway as a lead-generation option should know. Josh Earl is a freelance writer and programmer who started an email list of people interested in learning tips for using a sophisticated text editor called Sublime Text. After growing his email list to 5,500 subscribers, he wanted to run a giveaway contest to attract even more people to sign up for his list. But here’s the catch: Josh didn’t want to add just random names to his email list. He wanted to attract quality subscribers who would be his ideal customers. That’s the ultimate goal for any business, right? • He collected 187,991 email addresses. • His website received visits from 398,896 unique visitors. • Thanks to the flood of tweets that mentioned his contest (and included his Twitter handle), his Twitter following more than doubled, from 13,460 to 32,427. • The massive, sustained flood of traffic had a great impact on his site’s Alexa ranking. He leapfrogged 2,043,911 other websites and became the 49,137th most popular site on the Internet. #1 – He used his prize to attract highly qualified subscribers. Choosing the right giveaway prize can be tricky. If your offer appeals to an audience that is too wide, you could end up with a massive list of unqualified leads. But if your offer appeals to an audience that is too narrow, you could hurt your giveaway’s chances of being shared far and wide across the web. This is a delicate balance that Josh nailed. 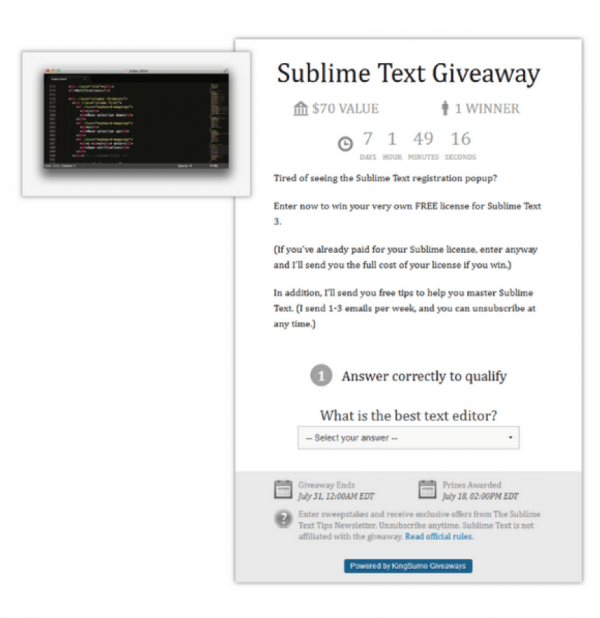 Josh gave away a Sublime Text license. This is a product that he knew had a substantial and established market value. He also knew the only people who would enter to win his giveaway were people familiar with, and maybe even regular users of, the text editor. These were his kind of people – people he knew he could sell to if he could get them on his list. And he did. Josh’s first book Sublime Productivity, which he promotes with his email list, has sold more than 2,000 copies and earned him $38,000, and counting. The important lesson here: Your prize is one of the easiest and most effective ways to attract qualified leads. Choose it wisely. #2 – He leveraged the self-interest of others. Josh figured out early on that most giveaways perform poorly because businesses rely on their entrants to act against their own self-interest. Thus, many giveaways never gain traction because people aren’t willing to share an offer if it means acting against their own self-interest. So, how do you make people feel good and excited about sharing your giveaway? You incentivize sharing to work in their favor, not against it. This is what Josh did: When a person submitted their entry, Josh had an entry confirmation autoresponder set up that plugged an additional offer. Each person who would share a special “lucky URL” (a unique link to his giveaway) and assist a new giveaway entrant would receive three extra chances to win. Doing this allowed Josh to engineer his giveaway for virality. When the iconic candy company Tootsie Roll released a brand new lollipop flavor in a limited number of stores, it didn’t generate too much buzz initially. Before hitting the global market, the company wanted to increase its brand awareness and receive feedback on the new lollipop flavor to make sure it would be a success. To accomplish both of these goals in a small window of time, Tootsie Roll organized a giveaway. 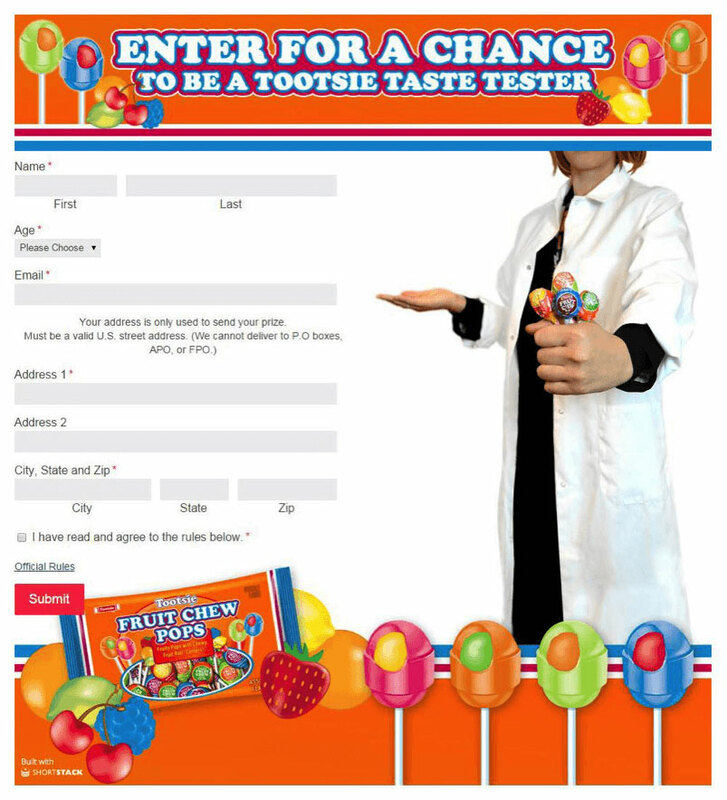 Using ShortStack, they built a branded landing page for their giveaway, allowing their fans and followers to enter for a chance to be one of the exclusive taste testers of Tootsie Roll’s latest pop flavor. After sharing their name, age, email address, and mailing address, entrants were narrowed down and sent samples of the lollipop with a survey for feedback. • They received 43,292 entries. This was a 702% increase in entries over a similar promotion they had run in the past. • Their promotion reached more than one million people. • From their 43,292 entries, they secured 400 taste testers, exceeding their original goal of 100. The 400 Taste Testers were mailed a Tootsie Roll Pops sample pack that included a printed insert with a Quick Response Code (QR code) that took testers to a survey with 10 feedback questions about the new pop flavor. #1 – They hosted their giveaway on a landing page that was independent from Facebook. While Tootsie Roll was looking to engage with only their Facebook audience, they wanted entry to be as seamless as possible. Publishing their giveaway as a landing page ensured that their mobile and desktop fans could participate in their giveaway without any barriers from Facebook. #2 – They treated their giveaway as an investment. To give their promotion momentum, Tootsie Roll made the choice to pay to play. They used a small advertising budget to extend the reach of their campaign beyond their organic audience. This investment paid off for Tootsie Roll, as they were able to increase the reach of the post promoting their giveaway by 587%. Two years ago, an innovative fragrance products company called JewelScent launched. What makes JewelScent different from all their candle, hand wash, and aromatherapy competitors? Hidden inside each of their products is a jewel valued from $10 to $7,500. To rev up sales and create awareness for one of their most popular and sought-after products, their jewelry candle, JewelScent hosted a giveaway the week before Valentine’s Day. Using the tool ViralSweep, they set up their giveaway with a single entry field. To enter to win, entrants simply had to share their email address. To encourage sharing, after a user pressed “Enter,” they were presented with several social media sharing options. Each share meant the entrant earned additional entries into the giveaway. • They received 15,675 entries, 3,431 of which were from new people who JewelScent did not yet have on their email list. This meant that about 22% of the people who entered their giveaway were entirely new people brought in by JewelScent’s current network. • They generated $11,659.33 in direct revenue and $7,117.16 in indirect revenue. This comes to a grand total of $18,776.49, which is $2,862.35 per day over the length of time the giveaway was running! #1 – They used tracking links to measure the monetary return of their giveaway’s efforts. When JewelScent started their giveaway, two of their biggest goals were to grow their email newsletter list and drive revenue. These two things do not always go hand in hand, but in JewelScent’s case they did. Why? Because they did the proper legwork that needed to be done once they collected their data (more on this in the next point). What’s more, they used a tracking link on the button that people would click to go to JewelScent’s website after they entered the giveaway. This helped them to know whether or not their giveaway produced sales. #2 – They kept in constant communication with their entrants. Email marketing played a significant role in the success of JewelScent’s giveaway. Throughout the duration of the promotion, their team communicated with their entrants via Facebook and email. Even after their giveaway ended, everyone who didn’t win was sent an email with a 10% off coupon. This effort generated $7,117.16 in revenue. The takeaway here: A giveaway is not valuable unless you put the data you collect to work for you. It’s what you do with your list (i.e., how you sell to your subscribers after your giveaway is over) that matters most. Giveaways can be an excellent option if you want to accelerate the growth of your email list. That said, there are still no shortcuts to the top. Climbing a mountain, even if you have assistance, is never a walk in the park. To truly reap the rewards of offering a giveaway, it’s imperative that you strategize, invest your time and other resources, and make use of all the information you collect to forge new relationships and drive sales. Have you ever hosted a giveaway to help grow your email list? If so, sound off in the comment section below. I’d love to hear your stories! This post originally appeared as a guest post on Kissmetric’s blog.